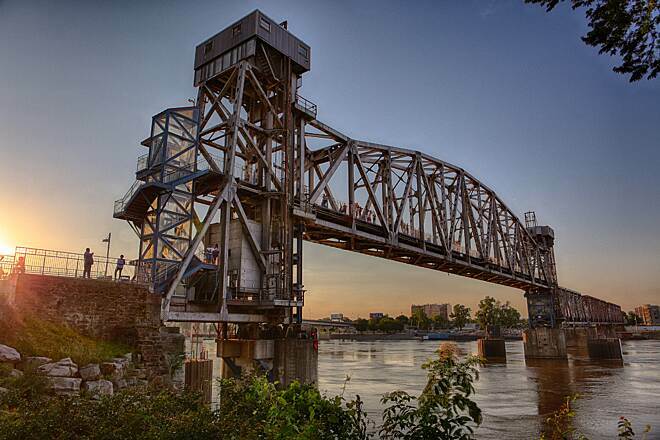 Spanning just over 21 miles, the Arkansas River Trail runs riverside through Little Rock and North Little Rock. 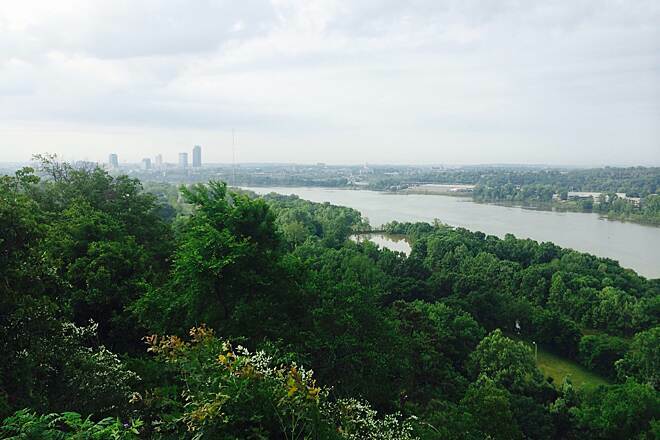 On the southern bank, the trail extends east to the Clinton Presidential Library and west to Two Rivers Park. The latter is a recreational highlight of the route; the park's 1,000-acre expanse offers wooded wetlands and open fields to explore on foot, by bike, or on horseback. 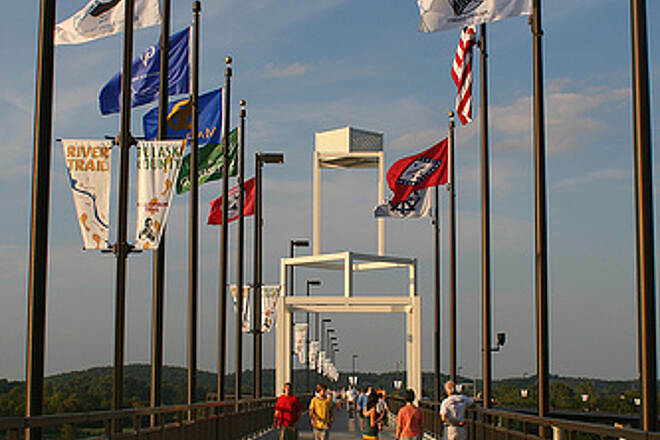 Trail goers reach the park by crossing the beautiful Two Rivers Park Bridge. 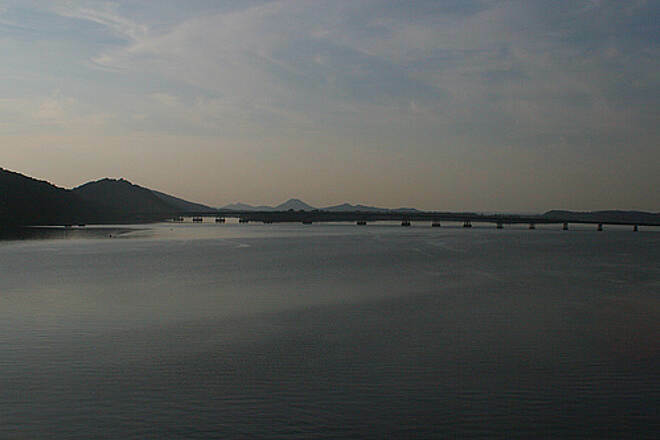 Three other bridges are part of the trail, most notably the Big Dam Bridge, which rises 90 feet above the Arkansas River. 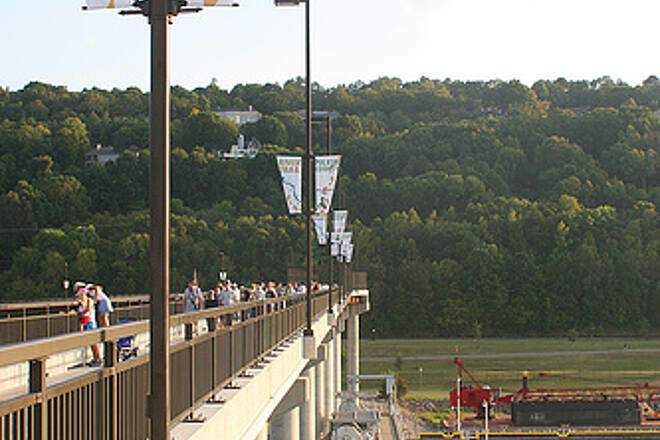 Spanning 4,226 feet, it is the longest pedestrian bridge in North America that has not been previously used by trains or motor vehicles. The other river crossings include two former railroad bridges converted for pedestrian use: the Clinton Presidential Park Bridge (which spans 1,600 feet and overlooks lush wetlands) and Junction Bridge, dating back to the late 1800s and spanning 360 feet. On the north shore, Burns Park is undoubtedly a highlight. It covers 1,700 acres and includes a historical log cabin, covered bridge, fishing pier, campgrounds, a 36-hole golf course and disc golf course, athletic facilities, and even a seasonal amusement park. Note that portions of the southern bank segment are under construction, with temporary detours and a few on-road sections. 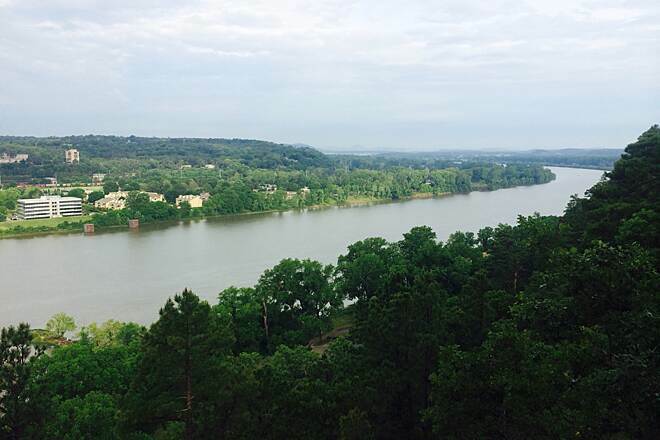 From Two Rivers Park, there are also plans to construct another 12+ miles of trail to Pinnacle Mountain State Park, connecting to the 225-mile Ouachita Wilderness Trail. 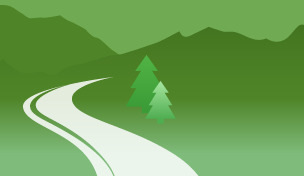 Future plans also call for a connection to the developing Southwest Trail, which will span 65 miles between Little Rock and Hot Springs. 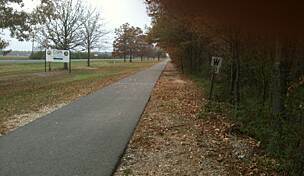 You can access the Arkansas River Trail in several places, including Cooks Landing, Burns Park's soccer complex and boat ramp, Riverview Park, North Little Rock Riverfront Park and Little Rock Riverfront Park (fee for vehicles), the Junior Deputy Baseball Complex, Rebsamen Park, Murray Park and River Mountain Park. The city of LR, NLR have partnered in establishing a biking and walking trail that can't be matched. It includes the "Big Damn Bridge, the Clinton Bridge and Two Rivers Park Bridge the investment in these bridges that only are for biking and walking is over $150,000 million. 90% of the trail is no cars and great asphalt surface. If you did the entire trail area it would be over 50 miles. 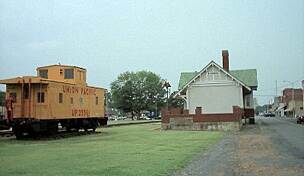 Restrooms, downtown and two places in NLR, and one at two rivers park. Bathrooms Clean and new. Have fun!!!! We rode 'around' the whole trail (both north and south sides)... HOWEVER, we felt the 'getting-lost' potential on the south-side (right around the police station) was HUGE. If we hadn't found a local to help us we would never have gotten to the "Big Dam Bridge" (way to the west) and so-forth. - HOWEVER, the trail, overall is VERY NICE and the North Side is EXCELLENT and the part near the Clinton Museum (regardless of your political leanings) is also EXCELLENT. - GREAT RIDE around the City! 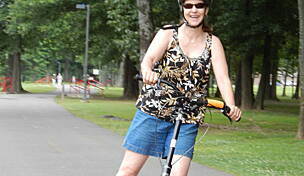 My husband and I rode the north side of the river trail today, April 16,2013. We are camping at the Burns Park RV park campground so were easily able to get to the trail. We did not ride from the campground but drove the car to the parking lot near the dog park area and rode up to the dam, then turned around and rode to the downtown area. We turned around when we got to the Clinton Presidential Library. It was a week day so there wasn't a lot of other trail users but we are sure it is highly used on the weekend. We chose not to ride the south side of the river, known as the "downtown" side because there is about 1.5 miles where you have to ride on city streets. We preferred the quieter side. The trail is beautiful, with a view of the river most of the way. There are multiple places to stop for a rest. We highly recommend this trail. We live in Oregon and just happened to be passing through. What a wonderful find!! The mileage posted for the River Trail is just one of many opinions I've seen. 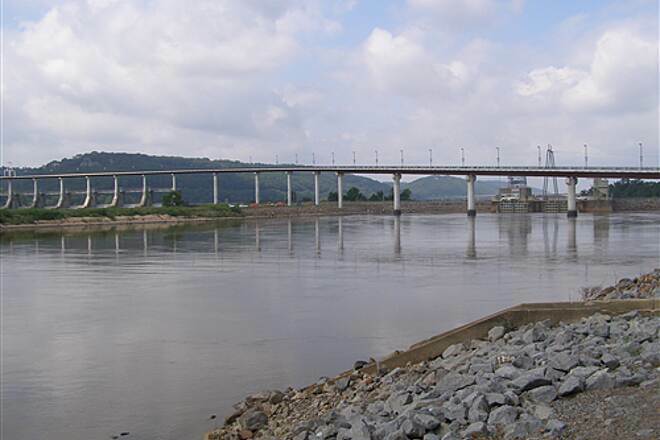 If you round-trip it, crossing the Big Dam Bridge at the west end and the converted railroad bridge at the east end, you'll cover about 15 miles. 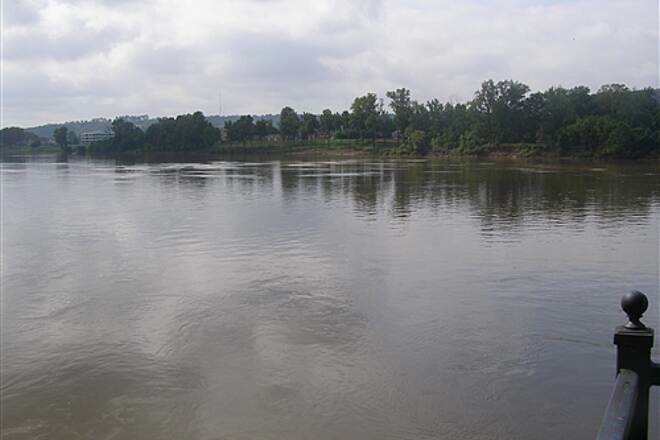 On the Little Rock (south) side, head west from the Big Dam Bridge to the new Two Rivers bridge, which is to be open July 23, 2011, cross to Two Rivers and ride another five miles or so of dedicated, paved trails on the peninsula. 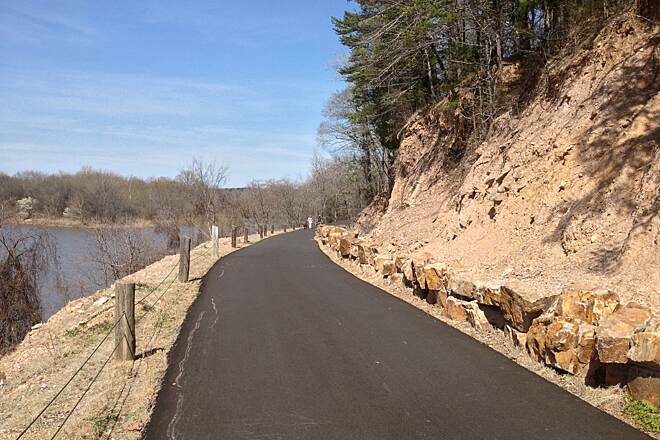 Caution: The east end of the "River Trail" on the Little Rock side is an abomination. The only thing that makes it a route is a few signs stuck along the streets or nailed to poles. It leads over broken-up sidewalks through run-down industrial areas, past homeless shelters, and over busy streets with traffic lights every block. 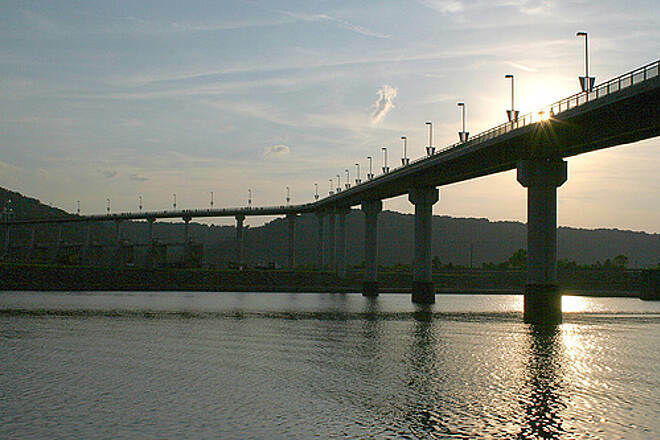 For the best experience, backtrack west from the east end of the Rebsamen Park Golf Course, cross the Big Dam Bridge to the North Little Rock side, and enjoy a beautiful, purpose-built and COMPLETE bicycling trail. Be sure to spend your money on the North Little Rock side - the state of the east end of the Little Rock side of the trail is inexcusable and should not be rewarded by tourism money. We rode this trail on Oct. 2, 2010 on a beautiful day. 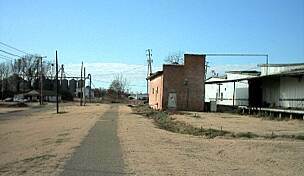 This trail runs alongside the Arkansas River. 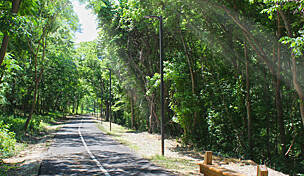 The trail contains some rolling hills, but it is not a difficult ride. Since we rode on a Saturday the trail was quite busy. The highlight of the ride is the ride over the Big Dam Bridge. The bridge is over a mile long and takes you over to the west side of the river. We tried to find the trail closer to downtown Little Rock and it is so poorly marked we could not find the trail. 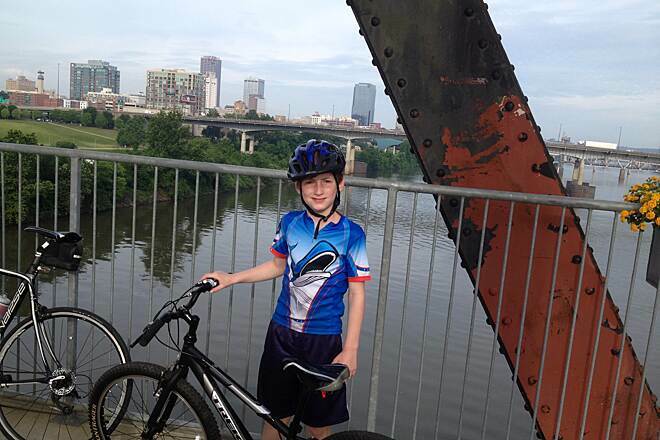 We were later told that it is not safe to ride in downtown Little Rock. The day before we toured the Clinton Presidential Library we were told that the old railroad bridge at the library will be converted into part of the trail in the very near future. The best place to park is at Cook's Landing. 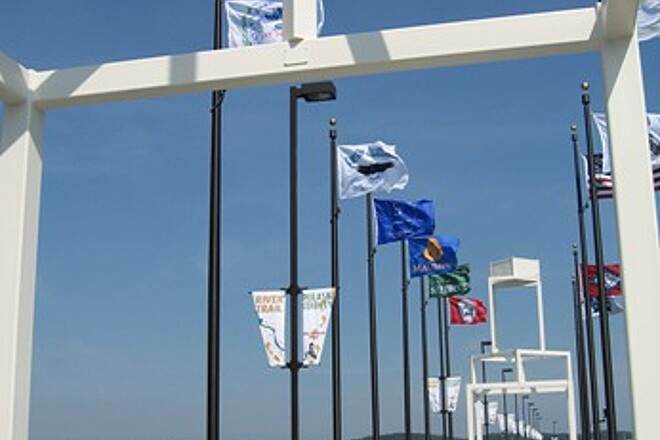 Drive north on I-430 until after you cross the Arkansas River and then exit on Maumelle Hwy 100 and then take two immediate rights and follow the well marked signs to the parking area. We rode the trail for the first time a couple of weeks ago and we loved it. We've been on other rides, and this one ranks very high on our list. The only negative is the way the trial is poorly marked when you get into lowertown Little Rock. However, the Big Dam Bridge more than makes up for it. We can't wait to return. We love this trail!!!!! We discovered it a couple of years ago while coming back from Hot Springs (we live in Branson, MO.) and have been back many times since. Any time we are traveling through the area we make sure we take time to stop and ride. We make special trips on weekends to come and enjoy the trail and the beautiful views. This past weekend we parked at the Big Dam Bridge and rode the north side and stopped at the "River Trail Bike Rentals" and meet David Fike. (stop in and say Hi) He told us about the "Junction Railroad Bridge" (which we didn't know about) that crosses over the river to the South side of the trails at the River Walk area. 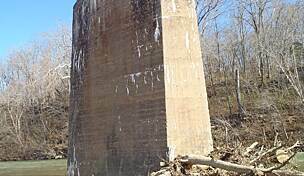 It is an old railroad bridge that has a raised section for boat traffic. To get to the upper section there is an elevator that takes you up then another elevator at the other end to bring you down! What a great experience and view! We stopped at the Farmers Market and then ate lunch at "Big Whiskeys" restaurant. (great food!). We then rode West on the South River Trail back to the "Big Dam Bridge" and back to our car. This last section of the trail is not complete and does go along some roads but is not dangerous. (does need some clearer trail markings). What a great day of trail riding and exploring! First off, it's important to note that time-of-day plays a major factor in using this trail. By 4-5:00pm the Little Rock (Rebsamen) side gets crowded with road bike cyclists and the Big Dam Bridge gets crowded with pedestrians. The North Little Rock Side is never very bad. Traffic flows well enough throughout the Burns Park area that you shouldn't have many problems. The NLR side of the trail is maintained very well, especially since there are a few points that wash out if the river floods. 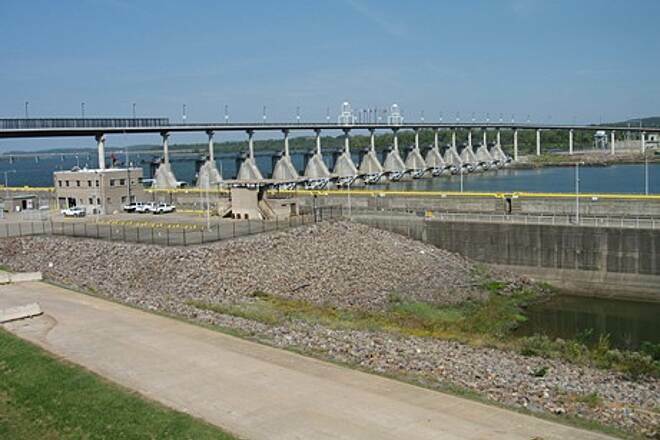 The trial is paved, not to many twists and turns, and almost no major hills, save for going form the NLR side of the Big Dam Bridge to the LR side; that is a long climb. 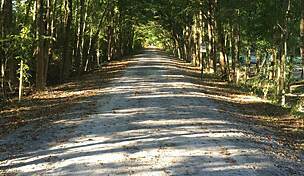 This is hands down one of the most professionally maintained trails you are likely to find in Arkansas. 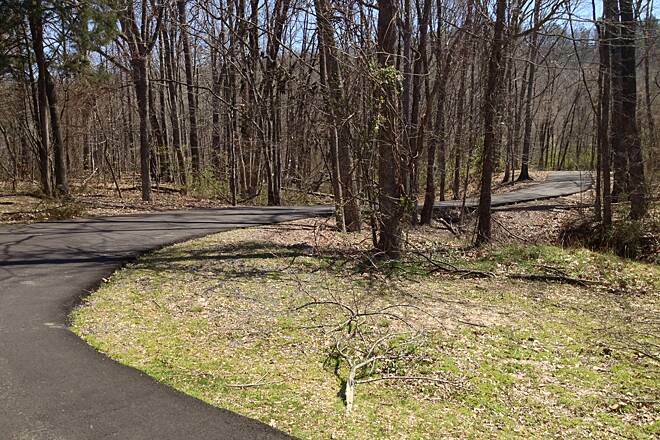 However, it is also one of the only trails in Little Rock, so it gets pretty crowded at times. 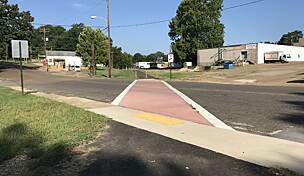 It should also be noted that this trail is not completed, and still does not make a full run to Pinnacle, and navigating your way to from the NLR side to the LR River Market can be tricky. Take the Main Street Bridge, turn left at the end and go into Riverfront Park. The trail will fizzle out and you will have to do some road riding. On Markham, there is a trail on the opposite side of the street from Dillards Office, next to the school, that runs under Markham, and up through Cajun's Wharf. Then you can link up with the Baseball fields, and onto the bike lane sin Rebsamen. My husband & I did this ride last week-end. Enjoyed the ride but was confused at times which way to go on the route due to the trail not marked in some places as to which way to continue. We'd never rode this trail before & would've like to have seen more arrows pointing us in the right direction. If we're ever in the area again however, we will definately try it again! Enjoyed the view from the bridge. 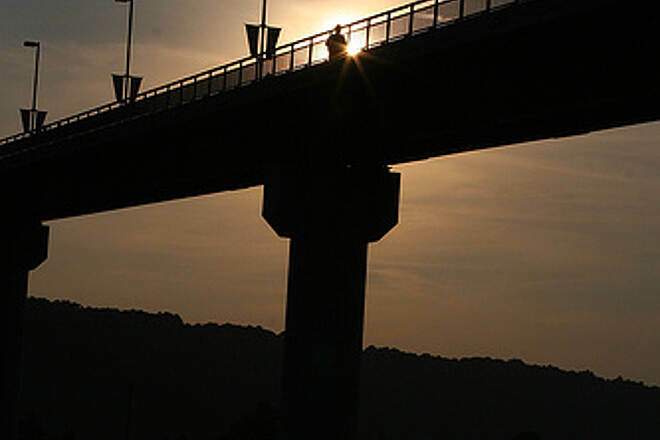 "The Bridge is quite spectacular, however it is difficult to cycle across. Several times I have had very small children run in front of my bicycle. I have also had people step in front of my bicycle when I announced that I was passing of the left. Because so many people use the bridge that have never been on a multi-use trail before, they don't pay attention to others using the bridge." 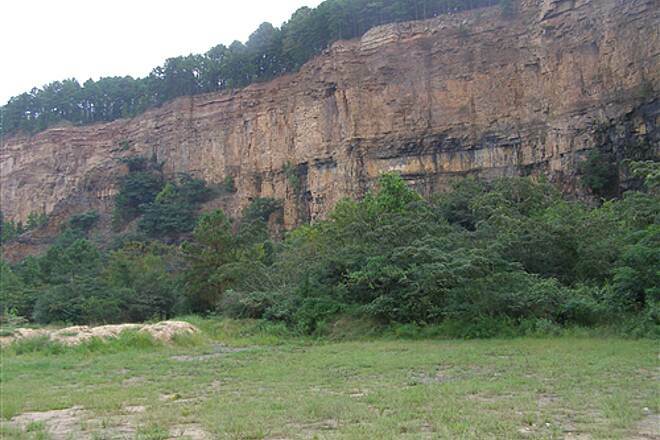 "My wife and I rode this trail in August 2005 and will definitely return. A terrific trail, in very good shape, that will get better when the bridges at either end are finished and turn it into a loop." 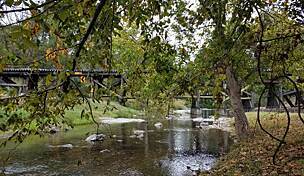 This is a beautiful that runs along the Arkansas River in Little Rock. If you get a chance to come here make it a point to run along this trail. You won't be disappointed!